The trout is a wonder of nature. Although he sees and preys on much smaller creatures he knows his place in the food chain. Even smaller trout get eaten by bigger trout. And there are other predators, including for example people who want to start fly fishing! The trout is well equipped to avoid predation and hence you. He cannot hear speech in the air (sound waves like this have little impact) but his lateral line behaves the same as a bats radar system. Except it detects pressure changes in the water and it is very sensitive. The point of this is contrary to non fly fishers belief fish are not swimming around looking for a meal between your legs. The trout get out of your way if they know you are there and fast. You are a hunter as sure as the Kingfisher itself, testing your skills directly against nature and the trout is your metaphorical prey. Most of us in this enlightened age believe in returning at least a large majority if not all of the trout we catch unharmed. However the fly fisher can at least help tilt the odds in our favour. In the trouts home it was pointed out that the highest density of trout in a stream tends to be near the head of stream and the fast current that supplies food and shelter. Here the trout's pressure detecting lateral line is confused by background signals, water rushing against rocks a heavy humming vibration of water. Here the trout relies on visual clues rather than his lateral line which are also confused also obstructed by the broken water. As long as we are stealthy and move slowly we can get close to and catch in this faster water even as fly fishing beginners. Despite this many fly fishers concentrate their efforts in the slower belly of the pool where fish can be seen rising and where the trout have a big advantage. 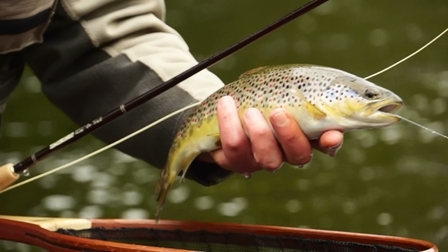 In broken water and with a stealthy approach fly fishers can get closer to and catch more trout. In loose biological terms the trout is an opportunistic sight feeding predator. Fly fisherman like this because it means he can be deceived. A great deal of the trouts prey lives in the river with the trout and most of is small aquatic insects. The study of these insects is a branch of entomology (the study of all insects). Trout fishing related entomology in itself is fascinating and many pursue it to a high academic level. It will be covered in interesting detail in the future on onstream-guide.com. But don't worry although entomology is a vast topic by the end of this your entomology will be good enough to recognize what trout are actually feeding on. Click the trout's menu to find out more.